It is not an overstatement to say that the roaring twenties revolutionized women’s fashion. It has left behind a legacy of subverting traditional gender roles by obstructing expectations, restrictions, and ideals, making fashion more accessible, innovative and creative today. The era, still having suffered the effects of the second world war, gave birth to transformative movements: a lost generation of writers that gave us some of the most iconic works marking American history (The Great Gatsby and A Movable Feast), women walking into the workplace (think Rosie the Riveter), and music was becoming more flavored with the introduction to jazz (thank you dearest Louis Armstrong!). So it is not surprising that women’s fashion should have been equally effected. The twenties bid a permanent “tootles” to the Victorian, tight fitting corsets, the Marie Antoinette sleeve puffing, the cringe-worthy powdered hairdo, and the stockings that really never had not much more of a purpose than the traditional gender divide that they likewise bid farewell to. 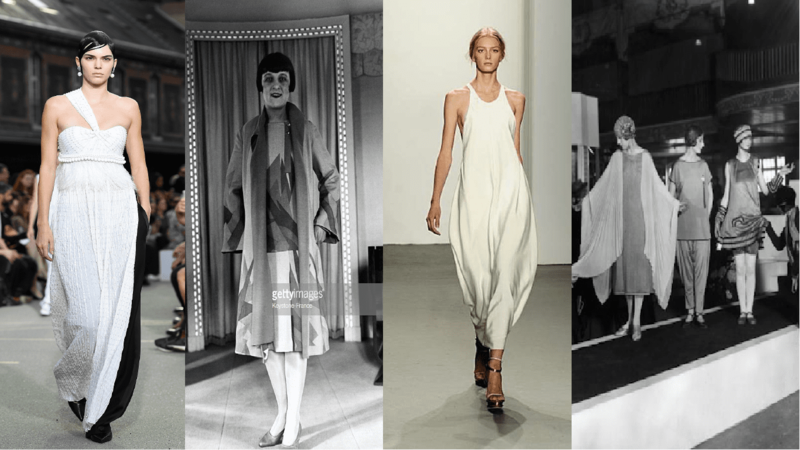 Designers like Chanel, Louis Vuitton, and Givenchy are revisiting the twenties in ways that don’t feel too out of touch or far fetched in 2019, so I’ve found some of the most natural of them for you to try. Here are the five trends of the twenties that have become staples, marking their glory on our own generation. Read on for 5 modern approaches to waring looks from one of the most evolutionary eras in American history, no matter what your personal style may be. From Gucci to Givenchy loose silhouettes is the wearable shape that has redefined femininity and still remains trendy during an age of female empowerment and solidarity. Dried flowers embellishing updos and bright, neon highlights seem to be having a moment, but strings of pearls, tiny watches, dangly hoops – the alluring seduction of jewelry is our pick, making us nostalgic for the days of smoky bars and red kiss-me lipstick. The ’20s are convey something of excitement, immediately calling to mind a new, rebellious, laissez-faire breed of women with bobbed hair, flouting about their nylon-less legs as they danced in secret hideaways coming to be known as speakeasies. Runway models and everyday working mothers alike are still seen sporting this style, timeless in its elegance and simplicity. A must-have accessories of the ’20, bold, printed scarves remain a dramatic statement piece, made ever the more desirable from designers such as Versace. Today’s daring, bold and independent woman is often seen subverting long time fashion taboos by clashing wild designs together and paring them with playful stockings and costume jewelry. Fashion legend, Gabrielle “Coco” Chanel introduced us the “Garconne” look which meant for more fluidity between male and female outfits, allowing for women to put on trousers. In the decade since the chic and boyish look was born the idea of fluidity in fashion has continued to transform as designers envision new ways of defining fashion and bringing men and women’s’ styles closer together in the form of more relaxed silhouettes, men putting on skirts, and both genders walking down the runways together.